With new Features that are going to be added to the RELIANCE ANYTIME MONEY CARD (popularly known as RELIANCE ATM CARD), a revolution is on cards with funds expected to pour into Liquid Funds from SB A/c. Lets get to know these features but before that let us try to understand whether we need Liquid Funds at all. Why Liquid fund and not a SB A/c? We have discussed this many times before but still I would like to do so one more time for the new readers that keep pouring into my Blog every day. There has been and there will always be a gap of 1% in FAVOUR of Liquid Funds. In fact, majority of Liquid funds have giving returns on par with Fixed Deposits and we all know that FD returns are more than SB A/c returns. It is only when you have LARGE amount (like in excess of Rs.1 lakh) that some Banks offer you higher interest (6% or so) where as Liquid Funds irrespective of your investment give you the same return without any bias. And now, coming to RELIANCE MONEY MANAGER FUND (the ATM facility is however, available for ALL RELIANCE MUTUAL FUNDs), the advantage over Savings Bank Account is that you not only get all the Convenience of a Regular SB A/c but also potential Higher Returns! Actually RELIANCE MONEY MANAGER FUND and RELIANCE LIQUID FUND is treated as Primary Fund and all the other funds you have invested in Reliance AMC schemes (like say Reliance Pharma Fund, Reliance Growth Fund) will be secondary funds. There is absolutely no charges for using this Card Facility. HOWEVER LIKE A "SONE PE SUHAGA" Reliance AMC has gone ahead and made some changes and added new ones which has made the RELIANCE ANYTIME MONEY CARD an absolute MUST HAVE in any investors portfolio. 1. The Withdrawal Limit has now been enhanced from Rs.50,000 by 4 times to Rs.2,00,000. 2. If the investor is redeeming the money from Reliance Mutual Fund's app SIMPLY SAVE (which is so easy to transact), the investor can redeem upto 95% of his investment with just a click of button on his Mobile! How more simple can redeeming your funds can get??!! 3. Third and the BIGGEST feature that has been added is that about the Redemption. Normally, in any Liquid fund, the redemption proceeds get credited to your Account the Next Working Day (T+1). But, now, Reliance has promised that your Redemption Proceeds from the RELIANCE MONEY MANAGER fund will get credited to your SB A/c within 30 minutes (yes, you read it right, within Thirty minutes)....How fast can it get? 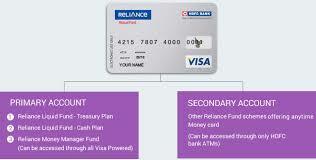 The new Features introduced in Reliance ATM Card has made the product more appealing. I am no salesman for Reliance Mutual Fund but I am ready to become one simply due to this amazing features that Reliance AMC added. Switch your money laying in the Savings Account to RELIANCE MONEY MANAGER FUND/RELIANCE LIQUID FUND right now and enjoy. Reliance Mutual fund has introduced instant redemption in flagship fund Reliance money manager fund. Investor will receive credit in their account within 30 Mts of submitting redemption request through Reliance website. It works 365 days and 24x7. Bank should be IMPS enabled. Maximum amount is 200000/- or 50% of the current value whichever is lower. As usual, you are requested to contact your Financial Advisor before taking any Investment Decision and the Author is not liable for losses arising out of any Transaction taken due to the above article or any material published in this blog. The information shared here is only a point of view and for information purose only.